‘ Well the Luck of The Irish’ was certainly with us when Cara & I spent a wonderful Easter weekend at Swords in Dublin watching our boys at the Combined Canine Shows. 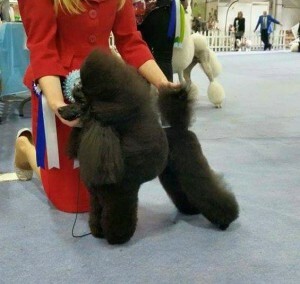 On the Saturday, Diesel ~ Ir Ch Sherrygold Prince of Harlem at Sharalo gained the ultimate title of International Champion and now becomes Sherrygold’s first International Champion. Huge congratulations to his owner Sarah Blount and thanks as always for a job well done! On Easter Sunday our new baby Siggy at only 12 months old flew round the ring showing his socks off winning his class and gaining the Reserve Green Star Dog against a much older Champion with Sarah handling (video below). Over the moon with both boys is a massive understatement and so happy to have been there. Congratulations and many thanks to all concerned and thanks so much for your Irish hospitality Sarah & Barbara we had a ball.